As a trusted biohazard cleanup company working here in the Pacific Northwest, we often encounter blood on projects we take on. Whether it’s the result of trauma, suicide, a crime scene, or an unattended death, the presence of blood causes our cleanup technicians to step up their preventative measures even further than our normal protocols. The same is true when used injection syringes (with needles) are present, such as in homeless camps or public spaces where IV drug users congregate to shoot up. Why do we take special care when blood is present in a cleanup scene? All three of these illnesses can be fatal. Becoming infected with any of these from contact with blood is usually via a cut in the skin (such as the needle puncture the police officer suffered) or contact with mucous membranes. Though on the decline since 1977 (a 95%) drop, due mainly to a new vaccine and massive immunization of health care workers, Hepatitis B still remains a health threat. It can cause severe liver damage and can be fatal. The estimated risk of contracting it via contact with a needle or cut is somewhere between 6-30%. Hepatitis C causes damage similar to Hep B. 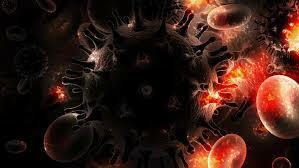 There are 4 other Hepatitis viruses – A, D, E, and G. All can be transmitted via contaminated blood, and it is believed that Hepatitis E can also be spread by drinking water contaminated with feces from an infected individual. Some are also sexually transmitted. Hep D, E, and G are rare in the U.S., but occasional cases have been documented. 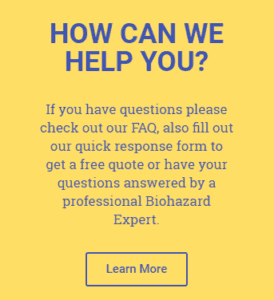 And if you have property that has been contaminated by spilled blood, we recommend you contact a biohazard cleanup company such as ours, with trained technicians and specialized equipment to safely decontaminate the area and dispose appropriately of anything contaminated with the blood. We are also experienced in property restoration, should tear-out of building materials, carpeting, and other furnishings be required.